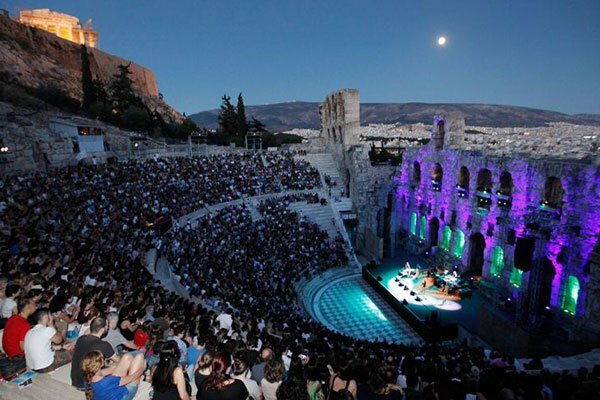 Several Greek productions and events will help kick off the annual Athens & Epidaurus Festival held in the Greek capital this summer, with performances at the Olympia Theatre and Peiraios 260 center. The festival program opened on Monday this week with the start of a photographic exhibition on the refugee crisis on loan from the Thessaloniki Museum of Photography, at the Peiraios 260 venue A, and the Bob Theatre Festival showcasing the work of fledgling theatrical groups, again at Peiraios 260. The three-day Sound Acts platform starting on May 26 will present a number of performances exploring gender, racial, and body identity through the medium of sound, while the National Opera will put on a production of Giacomo Puccini’s Madame Butterfly at the Herod Atticus Odeon for five nights, starting on May 31 and culminating on June 7. The June program opens with one of the most successful performances of last year’s festival, The Massacre at Paris, put on by The Little Things Orchestra, directed by Christos Theodoridis. The production won over audiences thanks to its tight dramaturgy and rapid pace, doing justice to a difficult yet poignant play that is considered one of the most enigmatic and misunderstood works by Christopher Marlowe. It will be performed for four nights (June 1-4) at the Peiraios 260 venue D, starting at 9 p.m. The first week of June will also feature Euripidis Laskaridis and his Osmosis dance group in their new production Titans at Peiraios 260 venue E at 9 p.m. on June 6-8. After performing ‘Relic’ at 20 international festivals, the group’s new production Titan will have its world premiere in Athens before moving on to Barcelona, Turin, Amsterdam, Paris, and various other destinations.